Today. You alone are your life. Don’t plot your destiny, for you are not future. Poem by Ricardo Reis (Fernando Pessoa) from the collection “A Little Larger Than The Universe,” which I read in one sitting in a garden that I can’t recall the name of and can no longer find on the map. All I remember is a pond, some trees and a lot of large geese walking by my bench. 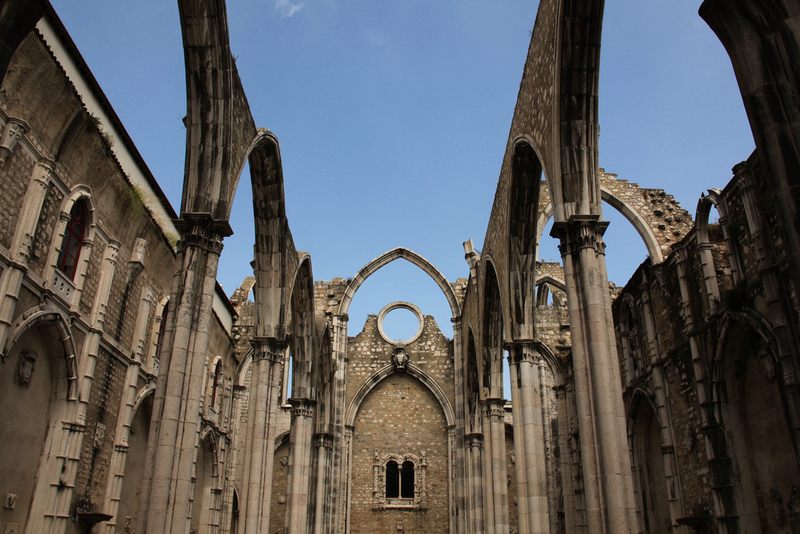 I took the picture at the Carmo Convent ruins in Lisbon, which was destroyed by the great earthquake of 1755 and only partially rebuilt, creating an unusually intact complex of ruins. I’m not sure who Lydia is but I felt like Mr. Reis was speaking to me. I was facing another round of goodbyes and didn’t see any point in pretending there would always be another hang with friends whenever I liked; a wedding or reunion that would magically take place once everyone got caught up or settled in. Wait around too long and you’ll wind up as withered as the Peruvian mummy in the Carmo Convent museum. She’s a beaut, all right, but no one I’d trade places with. Previous Previous post: Tourist = Terrorist?